The Office of International Program and Services welcomes all students to sample the many cultures represented on the Mason campus through their monthly International Café. The event’s mission is to make students comfortable with Mason’s diversity through international snacks and drinks, along with booths showcasing different countries and their cultures. Mason Ke Rang is anything but your average dance team. This past week Connect2Mason was able to sit in on one of the team’s practices. Within the first 10 seconds anyone would be hooked. Mason Ke Rang claimed first place at last year’s International Week Dance Competition, coming in as an underdog as their first year competing. MKR proved themselves as a force to be reckoned with by surpassing the expectations of the competition and challenging the traditional norms of dance within the Mason community. Two Scholars from India on Thursday explained that the Gandhian philosophy of non-violent resistance is the most successful way to bring down regimes. The Globalization in India Working Group hosted the event, “Non-Violent Resistance Today – Issues, Strategies and Challenges” on April 14. 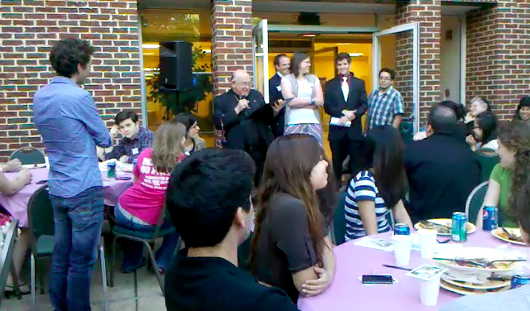 Many students and faculty members attended the International Week event. The 31st annual International Week kicked off this past weekend. The week, which is a George Mason University tradition, showcases the various cultures of Mason's diverse student body. C2M's Alicia Thayer collected GM View video footage of International Weeks from the past and compiled them together into the above video. Hello, studiers and academics (who like to get out and mingle). We've got a new treat for you. Connect2Mason’s Top 5 are our staff's picks for the week's best academic and learning events. Every Monday, C2M will post a new Top 5 which will highlight some of the most interesting, informational and creative academic events going on at campus this week.